Is there a blissful re-marriage in your Destiny? Ask Our Experts! Having a marriage that did not work out is both unfortunate and heart breaking. But this does not mean that you should give up on your wish of being in a happy & harmonious marital union in your life. The ancient & divine wisdom of Vedic Astrology has been helping humanity since centuries to identify and cure the real problems signified by planets & stars. 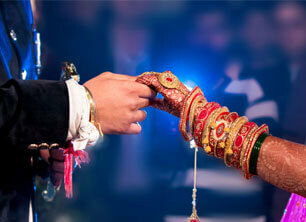 We urge you contact us and get your Personalized Re-Marriage Report. Exhaustive study of the marital aspect of ones life. In-depth analyses of the prime house of marriage. Revelation of time periods when Re-marriage is signified. Remedial measures to negate problems, on the path to Re-marriage. Incredibly accurate predictions about the timing of Re-marriage. Results of both benefic and malefic Planets for ones Re-marriage. Powerful and super efficient remedies to nullify hurdles in Re-marriage. Special analysis of Venus for successful Re-marriage.